In WATCHING THE ENGLISH anthropologist Kate Fox takes a revealing look at the quirks, habits and foibles of the English people. She puts the English national character under her anthropological microscope, and finds a strange and fascinating culture, governed by complex sets of unspoken rules and byzantine codes of behaviour. The rules of weather-speak. The ironic-gnome rule. The reflex apology rule. The paranoid-pantomime rule. Class indicators and class anxiety tests. 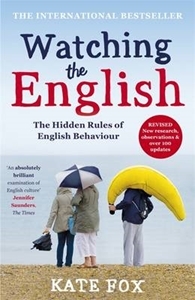 The money-talk taboo and many more ...Through a mixture of anthropological analysis and her own unorthodox experiments (using herself as a reluctant guinea-pig), Kate Fox discovers what these unwritten behaviour codes tell us about Englishness.